Reflections: Priyanka after dropping Robert to the Ed office. Businessman Robert Vadra, the brother-in-law of Congress chief Rahul Gandhi, has denied owning a series of properties in London during his six-hour questioning by the Enforcement Directorate on Wednesday. The central probe agency grilled him in a money laundering case at their office. A court has given Robert Vadra immunity from arrest till February 16 but also asked that he join the investigation. 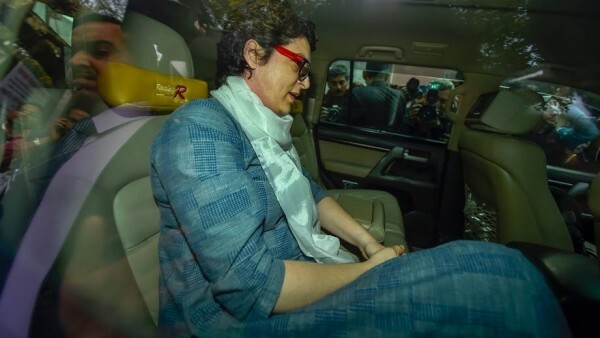 In a big signal to the BJP, which has been targeting her over the allegations against her husband, Priyanka Gandhi Vadra dropped him off at the agency's South Delhi office. "I stand by my husband," she said, adding that she wanted to send a "clear message" by her appearance at the ED office. Four days after a Delhi court ordered Robert Vadra to join the Enforcement Directorate (ED) investigation, he was questioned for over six hours on Wednesday. Vadra, the brother-in-law of Congress President Rahul Gandhi, arrived at the ED’s office located in central Delhi’s Jamnagar House at 3.45 pm and left at 9.35 p.m. The ED also lodged a money laundering case against Vadra’s close aide Manoj Arora after his role surfaced during a probe by the Income Tax Department into another case under the new Black Money Act and tax law against absconding arms dealer Sanjay Bhandari. The official said that Arora, an employee of Vadra’s Skylight Hospitality LLP, is a key suspect in the case as he is aware of the overseas investments and purchases made by his employer. Sending out a strong message to her political opponents, newly appointed Congress General Secretary, Priyanka Gandhi, backed her husband Robert Vadra and accompanied him to the office of the Enforcement Directorate (ED) here which quizzed the controversial businessman in a money laundering case. Making her first public appearance after being appointed as the Congress’ General Secretary in-charge of eastern Uttar Pradesh, she accompanied her husband in an SUV to the agency office in Jamnagar House at the mouth of the India Gate circle. From there, she drove straight to the 10-Janpath residence of her mother Sonia Gandhi and then walked over to the neighbouring AICC headquarters where she spent some time inside her office and met party workers.